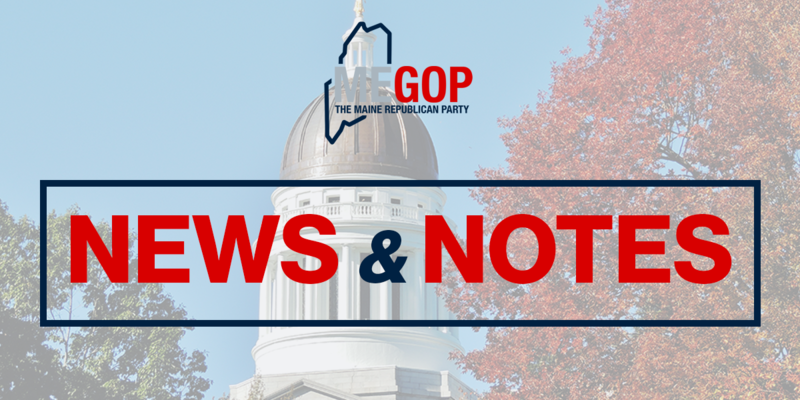 Augusta – After a strong election performance in November, the Maine Republican Party State Committee held their biennial election of officers on Saturday, February 14, 2015 in Augusta, Maine. Chairman Rick Bennett of Oxford, who was first elected in mid-2013 and led Republicans to historic victories in the November elections after overseeing a rebuilding of the Maine GOP staff and operations, was re-elected with unanimous approval from the 68 state committee members in attendance. A former President of the Maine Senate, Mr. Bennett served four terms in the State Senate and two terms in the Maine House. Mr. Bennett is founder and CEO of ValueEdge Advisors, a firm providing engagement services to institutional investors. Rick serves on the boards of directors of GWI, the Biddeford-based telecom company, and Trucost, a London-based environmental research firm. He is on the advisory board of Dirigo Capital Advisors and the board of trustees of Hebron Academy. “I am deeply humbled for the unanimous support of the Maine Republican Party State Committee. My commitment to the committee, Republicans across Maine, and all Maine people, is to continue to fight on your behalf, continue to build our party, and help our Republican officeholders carry our message of reform and prosperity to all Maine people,” said Mr. Bennett. Dr. Demi Kouzounas of Saco won election for Vice-Chair after a speech that focused on growing the party and reaching out to the hard-working people of Maine both through existing outreach programs and new initiatives. Vice-Chair Kouzounas is a Dentist and small businesswoman with nearly 30 employees at locations in Scarborough and Skowhegan. Along with her practice, Dr. Kouzounas also helped start “Bright Smiles,” a dental clinic for low-income children in Portland, and is co-founder of “Dentists Who Care For ME”, which provides a free day of dental care each year. Dr. Kouzounas is Immediate Past President of the Maine Dental Association, a non-profit association of about 650 dentists across Maine, and has served as a guest host of the Ken and Mike show on WGAN Radio in southern Maine. Born in Sanford, Dr. Kouzounas received her doctorate in dentistry at Tufts before serving our country in the U.S. Army. Dr. Kouzounas replaces outgoing Vice-Chair Susan Morissette, who did not seek re-election. Treasurer Ben Lombard of Yarmouth was elected to his second full two-year term with unanimous support from the state committee. Mr. Lombard is a practicing certified public accountant with a focus on income tax planning and preparation for individuals and closely-held businesses. He received a Master of Science in Accounting from the University of Massachusetts at Amherst and has served as volunteer Treasurer for a number of non-profit organizations. Barbara Campbell Harvey of Portland was elected as Secretary of the Maine Republican Party. In addition to her vast experience with Republican political organizations across Maine, Ms. Harvey also has served in a variety of positions for well-known organizations such as the Maine Education Loan Authority Board, LearningWorks, First Radio Parish Church of America, and Friends of the Blaine House. Ms. Harvey received her Master’s Degree in political science at Northeastern and lives in Portland, Maine. Ms. Harvey replaces outgoing Secretary Charles Mahaleris, who chose not to seek re-election after serving for eight years.